We’ve been holding this under wraps for the last week and a half, but now that we are ready to take it out and the local and international press has been informed, it is now time to disclose that since the end of the 2nd week Amit Dagan and his extraordinary team (who have been working double shifts on the site for the last week and a half!) have been excavating in Area D, in addition to the “regular” fantastic finds from the destruction level, a beautiful horned stone altar! The altar, made of one block of stone (50X50X100 cm) has two horns (not 4!) and a very nicely carved cornice on three sides. It is placed within a large structure which might be a temple (but it is too early to be sure). 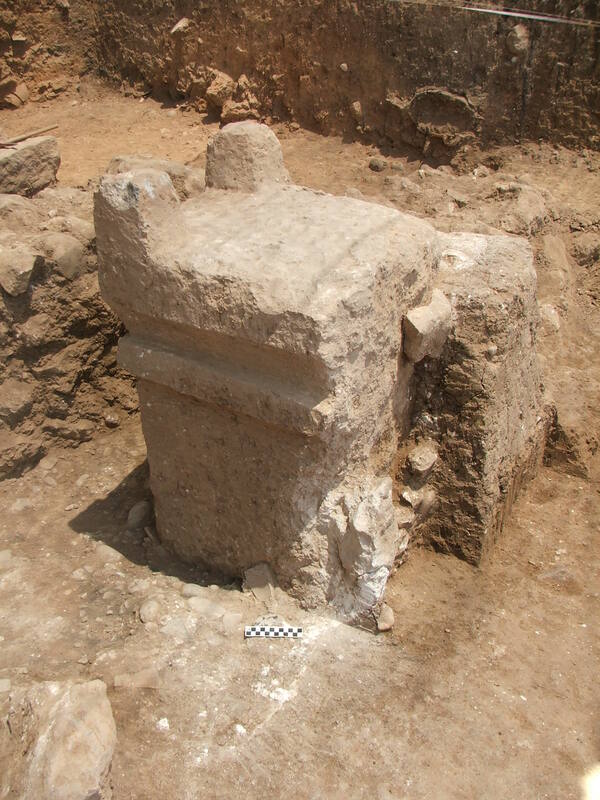 1) It is the earliest stone altar from Philistia, a precursor of the many stone altars that are known from 7th century Tel Miqne-Ekron. 2) It is one of the largest altars known (save for the Tel Sheva altar [which though is made of many stones] and an altar from Ekron which was found out of context). 4) It has TWO and not four horns – quite unusual for such altars. This is VERY interesting, since this may very well confirm a theory put forward by our team member Louise Hitchcock that there is a connection between the Minoan/Cypriote “Horns of Consecration” and the horned altars – perhaps brought by the Philistines. 5) Its dimensions are virtually identical to the dimensions of the incense altar in the biblical tabernacle (1X1X2 cubit) in Exodus 30! 6) Quite surprisingly, the back part of the altar, and part of the top is unfinished! While the back part might have been “built-in” to a niche behind it (and this could explain the unfinished parts) the top is hard to explain. 7) No evidence of burning or residues were found on top of the altar, although a very nice Cypriote “Black on Red” flask was found right near it. Perhaps it originally stood on top of the altar! 8) Surrounding the altar we found large concentrations of various types of vessels and several concentrations of astragali. Needless to say, there is a lot more stuff to be discussed! Here is a view of the altar from the back – note the unfinished parts! 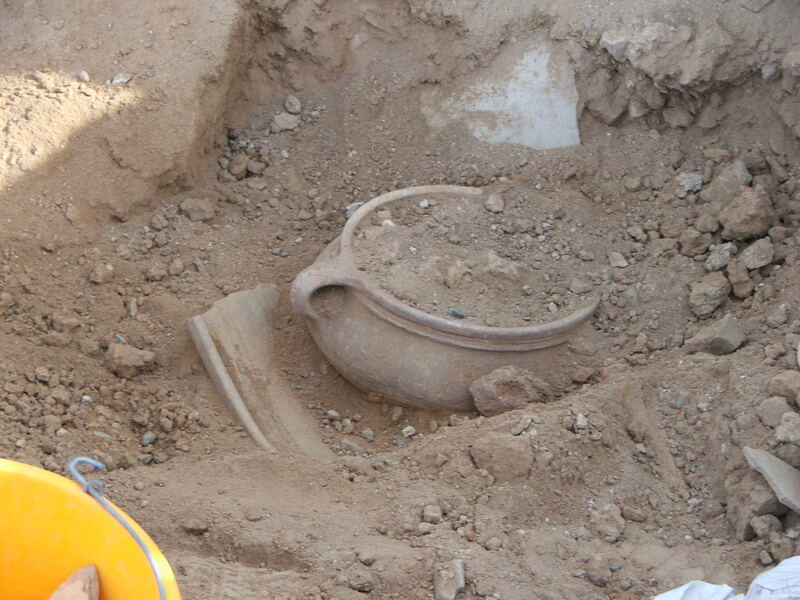 Here is a complete cooking pot which was found in a room just next to the altar – one of scores of vessels found in and around this area. And here is a picture of me, the proud father – note the smile! The altar is out – and a possible inscription! Kol Hakavod! Thanks for the great pictures! מעניין מי מצא מזבח יפה שכזה??? אין לי מושג, אבל מי שמצא בטח מאוד שמח. Great find! Is this unfinished or could it have been broken with the two additional horns on the opposite side now missing? Can’t tell from the pictures. Mazal tov!! A question: Seems like it isn’t a cube, and the part with the other hornes got busted.. How can you tell? Congratulations! Is that an amphora in the wall behind it in the second picture? “incense altar in the biblical tabernacle (1X1X2 cubit)” – was that the longer (Royal Egyptian cubit) or the shorter one? Mazal Tov! Will be interesting to see the zooarchaeological report of that area. There were not a lot of bones around it. In any case – it probably was for incense. Also, note that the horns are flat, not pointed. And, it’s only bizarre if you haven’t been to Cyprus. Hello! Did you consider the possibility that this was just an “half-altar” which could have four horns originally but half of it was destroyed in some point? From what we can see – it is not cut off, but simply unfinished on the back side of the altar. Although perhaps, originally they could have carved two additional horns, the current state seems to have been “roughed out” for only two. Congratulations! It is interesting, but the Bible has no mention of קרנים (dual of קרן horn) in reference to an altar, only קרנות (plural of קרן horn). It may mean that the authors of the Bible did not know of an altar with two horns or did not see any special significance to an altar with two horns as opposed to four. That definitely is a possibility. Do keep in mind that almost all other Iron Age altars have 4 horns, so in any case the two version one is not the “norm”. Perhaps two horns was the norm in the Bronze Age. ???? That “dual rounded top” is actually two horns as in a two-horned altar. This piece of rock art is also Bronze Age, not Iron age. Maybe??? Hard to say regarding the karkom petroglyphs. There is an Iron Age horned stele from Cyprus: it has 2 horns. To my knowledge, all Cypriot “horns of consecration” are flat topped (in contrast to Aegean pointed ones). If the Philistines really did come from abroad, there is no reason to expect that the Safi altar should conform to biblical descriptions of Israelite altars.. In fact, there is quite a lot of diversity with regard to horned altars throughout the Mediterranean and Near East. Furthermore, sculptures and worked stone were usually roughed out in the quarry (we have examples of this from both Greek and Egyptian art) then finished in situ. Thus the crafter finishing the altar would’ve known what s/he was doing. Roman sarcophagi were usually left unfinished in the back because they were meant to be placed against a wall (in contrast to Hellenistic sarcophagi that were sculpted on all sides). It seems to me, then, that this altar was meant to be viewed in the front and the side, but was intentionally left unworked on the side to the rear and on the back. Aegean altars appear to have 2 horns, but we mainly know them from 2 D representations. They could very well have had 4 horns, but this would not be evident from a representation. If such a representation or it’s description was the inspiration for this altar, this could very well be the result. I could go on, but I’ll stop here for the moment. Aren, just found your blog via Jim’s Zwingli fanboi page :-) That is one heck of a find – well done to you and all the crew. Thanks for posting this. Regarding the video from the excavation site – an archaeologists that quotes the Bible as a historical reference for the find (mentioning a chapter and a verse number) looks rather weird and raises a serious question about the very credibility of his finds, leaving out the interpretation. An archaeologist, or historian, of the ancient near east, who chooses to ignore the biblical text, simply due to the fact that it is not a straight-forward historical text in the modern sense of the word, is: a) taking the easy way out; b) unaware of modern mainstream biblical research; c) unaware of mainstream archaeological research that has demonstrated, time and again, clear interfaces between parts of the biblical text and the archaeological record. This does not mean that one should, in any way, relate to the biblical text as a historically accurate depiction of events in the Iron Age (or in any period), but, from there to throwing the baby out with the bath, there is a long distance. Separate your ideology from your cognition – one can, and in my opinion, MUST, relate to the biblical text when dealing with the archaeology and history of the Iron Age Levant – but judiciously. Automatically stating that any connection between Bible and Archaeology is wrong – unfortunately only demonstrates a deep lack of knowledge on current mainstream research. I do admit that I lack the knowledge about the middle eastern, and particularly the Levant archaeology of the Iron Age. What startles me each time I see or read about it is a clear ideological pretext which goes prior any scientific data. Partially this is a fault of the media which puts only a sensational aspects of the science into the spotlight, often adding the pretext which may not exist in the source. However, in my opinion, the archaeology of the Middle East is itself inherently plagued by several ideological issues which cannot be ignored. And, in fact, it is what you called the mainstream research that suffers from them the most due to the fact that it is financed by the parties that are involved and which expect a particular outcome. I wouldn’t say that this completely undermines any work done under this ideological patronage, but it cast a shadow. Regarding the quotes from the Exodus, the book itself was written several centuries after the events that are described, if there were any events. Can it be still used as a source – there is no doubt about it. However quoting it literally in regard to an object which identity yet to be determined would be a very bold statement sparkled with an agenda. I am not going to declare a little personal war on middle eastern archaeology, – it just struck me again how much bias it brings. Regarding this particular stone, in fact it is great that it was discovered during a regular excavations and not by some mysterious bedouins like many artifacts on which the mainstream research of the middle eastern history is based. Hi! It does not mattern when the text of Exodus was written, compiled, edited and published. What is interesting is that it described an object of similar shape and dimensions. And even if one would sat that the text of Exodus dates to the time of the “sojourn in the desert” (when ever that is…), it would not be the same date as a 9th cent. Philistine altar. All this says is that there might be a mutual cultural connection between the description of the altar in the book of Exodus and the object that we found. It means that the events (real or imagined) written down by someone (or someones…) in the Exodus may have been written down with similar objects in mind. Since these objects only appear in the Levant in very specific periods, this is of interest for studying the cultural milleiu of the Exodus text. As to funding: Unfortunately, despite the cabalistic believes, very little of Israel archaeology gets funding from ideological groups. In fact, this is the outstanding cases. 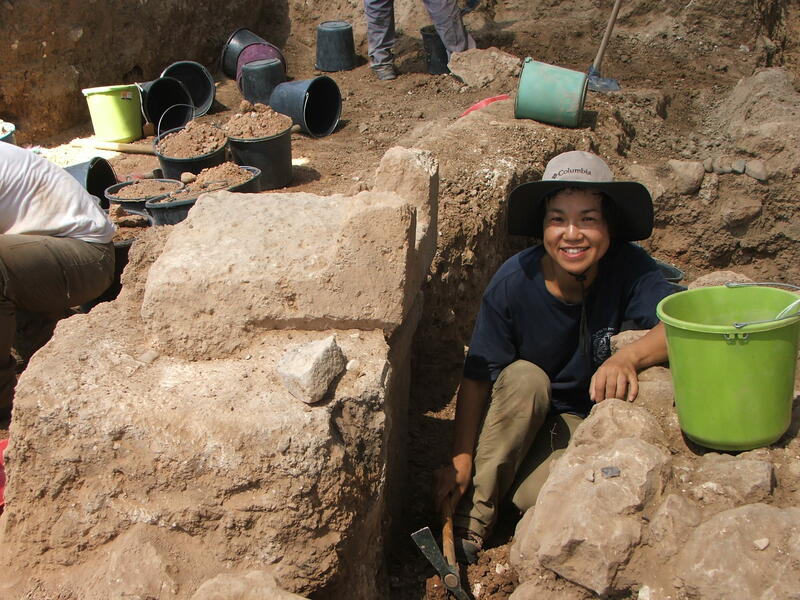 Most archaeology in Israel, like archaeology throughout the world, fights day in and day out for funding, and is always lacking. The ONLY reason that I have been able to continue excavating, analyzing and publishing for the last 10 years is due to the fact that I have fotunately have had success receiving scientific grants from Israeli, US, German, Australian, Canadian and EU scientific granting agencies. What a great photo. I am so excited your note to people. 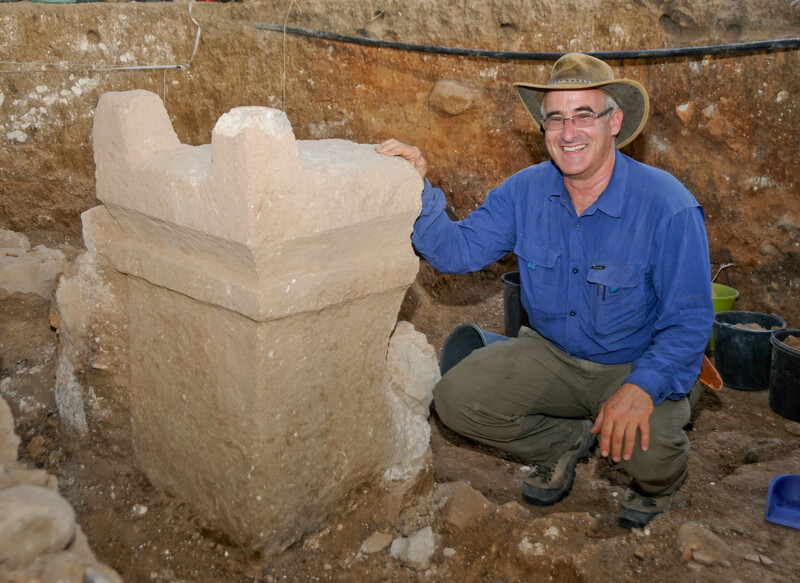 stone altar in Area D | The Tell es-Safi/Gath Excavations Official (and Unofficial) Weblog” ended up being great! Who can I contact about using one of these images in a publication?